The mission of The Lingerie Alliance is to unite lingerie professionals from all aspects of the industry to elevate the industry as a whole....It's great to see it happening! 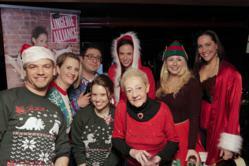 The Lingerie Alliance celebrated a successful “Festive Affair” Holiday Networking Social earlier this month on Tuesday, December 18, 2012. The invitation-only affair took place at Legends Bar in New York City with attendees enjoying a night of festivities and networking. "The mission of The Lingerie Alliance is to unite lingerie professionals from all aspects of the industry to elevate the industry as a whole....It's great to see it happening!" said Moira Nelson, cofounder of the Lingerie Alliance. "When Luis and I came up with the idea for The Lingerie Alliance, this is exactly what we envisioned! It was very fulfilling to see it come to life!" Event sponsor, LELO provided prize baskets for guests wearing the ugliest holiday sweaters. The contestants were judged by Roslyn Harte and the winners walked away with LELO intimate lifestyle products valued in total over $1,000. "Congrats to the Ugly Christmas Sweater Contest Winners- Jené Luciani & Amy Conway, Nikky Waters & Nancy Healey! Enjoy your luxury pleasure objects provided courtesy of our key event sponsor LELO - the world's leading designer brand for intimate lifestyle products," added Nelson. "And thanks to Chez Johnson of byChez Designer Lingerie Boutique for sponsoring 'A Festive Affair.'" The Festive Affair Holiday Networking Social marked the last in a string of successful 2012 events by the Lingerie Alliance. More events, shows, seminars and networking opportunities are scheduled for 2013 noted Moira. The event was covered by the lingerie news site, The Lingerie Journal. Please follow The Lingerie Alliance on Facebook at http://www.facebook.com/TheLAlliance to stay up to date on the progress of our web development and upcoming initiatives and events.